Ergonomic designed dispenser allows for accurate application. Cap protects adhesive when not in use. Quick change cartridges just drop in. Non-toxic, acid-free, dot-matrix patterned, permanent adhesive. Xyron has done it again! An ergonomic permanent adhesive handheld that is easily accessible without the mess. The Mega Runner is a popular permanent adhesive runner that features an ergonomic handle. Although, it has the shape of an hair dryer, it is design to provide 1/2 inch wide by 100 feet of Acid-Free, Non-Toxic permanent adhesive. The heavy-duty adhesive dots create a permanent hold and aggressively bond the materials together. Preserve and protect the adhesive with a convenient cap, make every last one dot count! Dimensions: 6.75" x 8.25" x 1.5"
Awesome Product Review by S.
Awesome product, really easy to use! This was definitely a sweet deal I feel, yes it was. Good tape gun! Review by Steph D.
Great quality and perfect for paper crafting! Great value -- can't beat the price. The tape is on the thicker side (1/2"), so it works better on larger projects -- smaller ones are better suited for a mini roller (1/4" or smaller). Hello and welcome to MyBinding video. 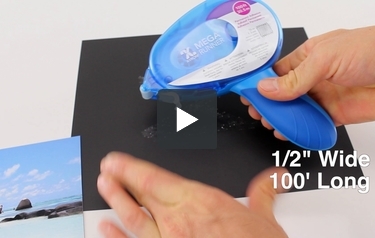 This is the Mega Runner, Xyron’s permanent adhesive glue gun, for a lack of a better term. This is the glue stick at its finest. No more messy sprays or fussing with tapes. Now all glue sticks run out. This one is 100’ in length, so running out doesn’t happen too quick. It paints a nice adhesive stripe that’s a half inch wide, making it great for small delicate work and crafting, yet because of the construction it can do lots of work fast, and when you do eventually run out, there are replacement cartridges. That’s Xyron’s Mega Runner. For more demos, reviews and how-to’s, check out MyBinding.com. Hi! I’m Beth Kingston here with a few quick tips on how to get the most out of your Xyron Mega Runner. When you’re using your Mega Runner to apply adhesive, if you’re rolling it and you find you don’t have quite a full line of adhesive, try rolling your wrist back in the other direction. I’ll show it going the opposite way as well. Just roll it back so it’s flat on the paper and that’ll give you a nice, full line. If you go a little bit more slowly, you’ll have a chance to check out where your adhesive is going. Another tip is if you need to tighten your refill, you simply take it out, hold this end tightly and turn the handle, turn the little knob. That will go ahead and tighten the adhesive roll and you can insert it right back into your machine, close the handle and you’re back in business. One last tip: when you’re rolling it across the paper, as you get ready to lift up, tilt it back and that’ll make sure it’s ready to go for the next strip of adhesive you want to set down. Just roll it back. For more information about Xyron products, come check us out at xyron.com. Transcript: Speaker 1: Hi! I’m Beth Kingston and this is Jessica Barnett, and today we’re going to show you how the Xyron Mega Runner and Tape Runner make it so quick and easy to finish your projects. So we’re making a mini-album which is spectacular over here. And we’re just going to take our pieces of paper, fold them in half. I’ve got the Mega Runner, you’ve got the Tape Runner. Oh, you’re folding first. Fine, I’ll fold first too. Speaker 2: It’s a race now. Speaker 1: Hi! I’m Beth Kingston and this is Jessica Barnett, and today we’re going to show you how the Xyron Mega Runner and Tape Runner make it so quick and easy to finish your projects. So we’re making a mini-album which is spectacular over here. And we’re just going to take our pieces of paper, fold them in half. I’ve got the Mega Runner, you’ve got the Tape Runner. Oh, you’re folding first. Fine, I’ll fold first too. Speaker 1: What I like about these is they come pre-filled. Mega Runner has got a hundred feet. The Tape Runner has got 40 feet. Speaker 2: I love this little guard, actually. Speaker 1: I know. Isn’t that fantastic because if you are cutting around in your crop bag and you accidentally get some fibers or something on it, it’s protected for the next project. I mean, look at how smoothly this goes on. Are we racing? Is this going to be a race of some sort? Speaker 1: All right. I’m good. Speaker 2: We’re going to fight later. Speaker 1: And what’s nice is that, you know, I put on a piece of rectangular paper and I’m putting on an old page so you can kind of run it along the curves. It goes so easily. Oh, look I’m done. But I’ll show everybody how easy it is to refill. You open this up. Literally lift this out. There’s nothing you have to roll around, nothing that has to wrap. Reinsert it, close the handle, ready to go. Tape Runner, same way. Oh, look, you’re finished too. Fantastic. And then you would just take your hole punch. Boop, boop, boop! Your crocodile, insert it into the album, and you’re done. We’re geniuses. Speaker 2: I know. They look lovely. Speaker 1: For more ideas or information about other Xyron products, come check us out at Xyron.com. Thank you for your question. Unfortunately there is not a re-positionable adhesive refill available for a Xyron Mega Runner.